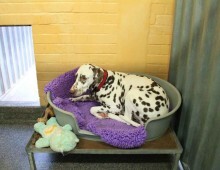 We offer boarding accommodation in two purpose built kennel blocks. Each individual kennel comprises of a large indoor sleeping quarters and a covered outside run, to which the occupant has constant access throughout the day. Each kennel can comfortably accommodate more than one dog which enables you to board your dogs together. We also have four extra large kennels that comfortably accommodate up to three large breed dogs or two extra large breeds. The indoor quarters have a removable fold away bed that provides raised sleeping arrangements. We provide an appropriately sized plastic bed and a freshly washed fleece lining. However you are welcome to bring along your dogs favourite bed and bedding if you so desire. The information you provide assists us in providing the individual care and attention to ensure your dog’s stay with us is as comfortable and enjoyable as possible. We strive to understand the character, the personality, the likes and dislikes of all our guests. Following the morning cleaning, health check and feeding, every dog is given personal attention throughout the day which includes playing, brushing and cuddling. 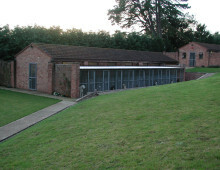 We have two large exercise areas which the dogs enjoy at least twice a day. We will feed your dog according to it’s age and condition from our extensive range of Eukanuba and Royal Canin premium complete foods, and wide selection of tinned foods. If you would prefer to bring your dog’s own food, we will be happy to feed this to your instructions. If your dog is receiving medication or supplements, our experienced staff will administer this as instructed by your vet.